Forward Slash Technology offers the latest version of hosted Exchange - Exchange 2010. Because your business relies on e-mail as one of the most important means of communication, you want to choose a provider that can offer the most secure infrastructure available. With options such as larger e-mail boxes, total browser support, security and mobile device support, hosted Exchange services through Forward Slash Technology can not only save your company money, but will also help your business streamline the e-mail processes so central to everything you do. Forward Slash Technology is a hosted Exchange provider based out of the St. Louis area. Our hosted Exchange servers are available to small and mid-size businesses throughout St. Louis and across the country. As a hosted Exchange server provider, we offer full service Exchange server hosting. These services include migrating new customers' email, contacts, calendars, and other resources to our hosted Exchange server. Additionally, we offer live and local support for those businesses interested in outsourcing help desk services. To learn more about services available with our hosted Exchange server services and to determine if Forward Slash Technologies is the best hosted Exchange server provider for your business, contact our IT company today. What is a Hosted Exchange Server? Hosted Exchange is an innovative server that enables small and medium-sized businesses to take advantage of the latest technology while reducing costs at the same time. When using hosted exchange server services, all of the necessary hardware and software required to run and maintain your server is owned, maintained, and updated by the third-party hosted Exchange server provider. This can have great cost-saving advantages for any small, medium, or large company. Hosted Exchange server hosting allows you to utilize the latest products and hardware without having to spend thousands of dollars purchasing software, constantly monitoring data availability, and ensuring software updates are installed. Additionally, when utilizing a hosted Exchange server provider, you can select and pay for only the server space and services that you require. The hosted Exchange server hosting services available from Forward Slash Technology are available to businesses located throughout the St. Louis area and across the country. As a leading hosted Exchange server provider, we offer a fully-managed hosted Exchange service. We run and maintain the Exchange server infrastructure so that all you have to do is connect to the service. The hosted Exchange servers that Forward Slash Technology utilizes offer the superior performance and reliability that any company demands in order to keep their business running smoothly. Contact our IT company for more information today. Our hosted Exchange server services offer a number of benefits to small, medium, and large-sized businesses including a substantial cost savings when compared to hosting one's own server in house. 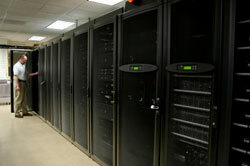 As a hosted Exchange server provider, our servers offer superior reliability and performance. The following features are available with our hosted Exchange servers. To learn more about additional options available with our hosted Exchange server, please contact our IT company.